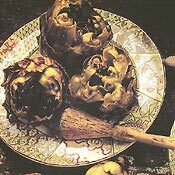 RECIPE TITLE "Jewish Artichokes Recipe"
Served above all in Rome, this dish used to be found only in the restaurants of the so-called Jewish ghetto area around Portico d'Ottavia, but now one can eat it in almost any restaurant. Sango Set of 4 Gold Dust French Onion Soup Bowls, Green These French onion soup bowls are traditional in shape with one handle at the side. From the Gold Dust Green collection from Sango, the French onion soup bowls have rich colorations and a striking, bold pattern. Set of four. It is essential to choose very young artichokes of the type the Romans call cimarola for this dish. Remove the tough outer leaves from the artichokes. Using scissors, trim the stems to about 1 1/2-inch long. Using a small, sharp knife, shape the artichokes one at a time by turning them with one hand as you cut to remove the toughest parts of the remaining leaves. Peel stems. As each artichoke is prepared, plunge it into a basin of water and lemon juice to prevent darkening. As soon as all the artichokes are prepared, remove from the water and dry well. Bang each artichoke against the table so it opens out like a sunburst. Dust the insides with salt and pepper. Put a wide, high-sided pan on to heat with sufficient olive oil to reach half way up the artichokes when they are laid on the bottom. When the oil is hot (but at less than its maximum temperature), add the artichokes and cook, turning often, about 10 minutes. Turn the artichokes over and stand them, head down, in the pan. Turn up the heat to its highest and cook for 10 minutes. Remove the artichokes from the oil and drain on paper towels before serving. French Diet : Why French Women Don't Get Fat, The French have the lowest average body weight per capita in the western world, and yet they eat famously well. Montignac explains in The French Diet that this not only has to do with which foods the French choose to eat, but their quality, freshness, and most importantly, the way that they are combined. Although the book is based on the concept of glycemic index (GI), which other diet books discuss, The French Diet is the only book that provides the net GI values of combined foods. Already a phenomenon for years in Europe, Montignac's dieting methods have been helpful to tens of thousands of people around the world who have achieved impressive and long-lasting results and reduced their risk of developing cardiovascular disease. The diet has also found a celebrity following among devotees like singer Kylie Minogue and fashion designer Christian Lacroix. Written for a range of readers, from those who dine out frequently, to yo-yo dieters, to those who don¹t want to give up wine or the good life but who do want to lose weight, The French Diet reveals the secret to living, eating, and looking like the French with this delicious, deprivation-free diet. Simple French Cookery World-renowned chef Raymond Blanc shows you how to recreate authentic French family cooking in your own kitchen with 40 simple-to-follow recipes. Discover how pleasurable the simple, creative act of cooking can be, as Raymond Blanc reveals the basic techniques needed to create 40 classic French dishes. From quick and easy Roquefort, Walnut, and Endive Salad to a more elaborate Duck Leg Confit with Flageolet Beans, every delectable recipe is illustrated with step-by-step color photos as well as fool proofed instructions.